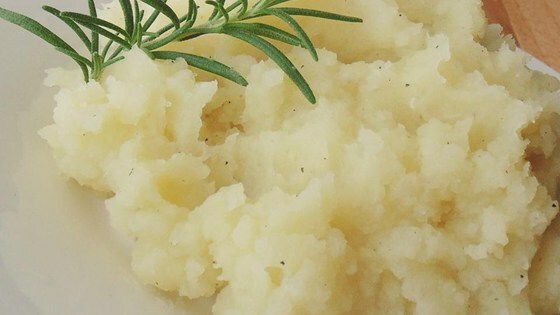 "This is a light and flavorful alternative to calorie-packed mashed potatoes! I got the recipe from a cooking class in Cambridge, MA." 1Place potatoes, garlic, rosemary, and thyme in a large pot and cover with salted water; bring to a boil. Cook, covered, until potatoes are easily pierced with a knife, about 30 minutes. Drain, reserving 1 cup cooking water. 2Transfer boiled potatoes and garlic to a bowl; discard rosemary and thyme. Add olive oil, salt, and pepper. Mash with a potato masher, adding cooking water to reach desired consistency.